William Vaughan of Newtek asked me to do a profile about "The Potter" after I showed him the piece. William is known as Proton on most of the boards online and is a huge asset to the Lightwave community in particular. He is also a guy that is free in sharing his knowledge and even his models at times. I'm very appreciative of his interest in the project. Here is the Profile. So, I'm animating a Rhino for a project for a couple of friends who worked on "The Potter." It's a match to live action project. Jon Campbell did the match move and Scott Spencer modeled the rhino and is doing the displacement maps for the big guy. They asked me if I'd animate the Rhino, and I said, "Sure." I've been working the last few days on getting the mechanics of the movement down in between my client work. Think I'm about done with the client stuff for a bit and will be able to really focus on this. I'll try and get some tests up soon. 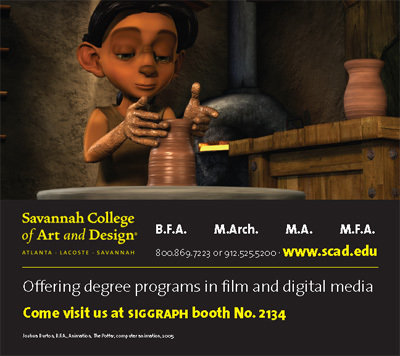 I also found out the school is doing an ad in Cinefex using a still from "The Potter." I got a hold of a pre press copy of the ad yesterday and thought it was pretty cool. This particular shot was animated by Ben Willis. My buddy, Keith, just sent me a link for a painfully honest story of the fall of Big Idea. It's a long read, and a sad one, but for anyone thinking they may want to one day have their own company or run one, I think it's a must- Here it is. So I grew up loving LucasArts games- Full Throttle, Sam and Max, Day of the Tentacle, Grim Fandango. So Tim Schafer, the guy behind many of those games, left LucasArts at some point and either started a little company called Double Fine Productions. I went and picked up my copy of Psychonauts last night and as soon as I got home, I threw it in the old XBox. The game just oozes style and I found my self laughing out loud more than once (every few minutes). I played for a few hours and thoroughly enjoyed it. The animating is actually very good for a game and the characters are all unique and entertaining just to look at. Raz especially has some nice little animation moments. A couple of times I just sat there in game listening to some of the characters yammer. Some of them would keep conversations going for a few minutes and were hysterical. One of the main premises of the game is that you go into other people's brains metaphysically. I've been in 3 so far and each was completely different both play mechanic wise and look wise. Right before calling it quits I got my ability to start fires. Being somewhat of a childhood pyro myself, I felt that was a good place to stop- before too much destruction ensued. If you're looking for a laugh and some funk in a game, check it out. So I got my new mac laptop about a week ago. About a week later, Apple announced the upcoming release of Tiger. My friends who are mac owners told me I should get a discounted upgrade since I just bought the computer. Made sense to me. Most software publishers I've dealt with have had pretty generous upgrade grace periods- some as long as a few months. So I called up Apple and was surprised to discover that the cut off date for their "up-to-date" program that would have allowed the discount had a cut off of April 12. 3 days after my Mac shipped. I told the lady that seemed a little short for a grace period window and asked to speak to her supervisor. She transferred me directly and I asked her supervisor who frankly seemed to me more irked that her underling had transferred me than about my issue. She asked for the first girls name and I just said I didn't know because I didn't want to get her in trouble. She said she would transfer me to someone who would help which ended up to be a stupid phone message loop of, "Press 1, press 2, no, you can't talk to someone." So I hung up and emailed Apple my frustration. I've not heard back to any of my emails to them, so I'm not holding my breath. Lesson learned here- If you're thinking about purchasing a Mac and they're "close" to releasing a new OS. Wait till they announce the release date and you'll save yourself $120 bucks or so. Guess I'll wait a while to upgrade. You ever have one of those weeks where you can't seem to get any traction? Well, this is one of those for me. Lots been going on but not been getting a whole lot done. I got my first Mac ever - a little 12 inch power book. So, that's been taking some getting used to, but I really like it. I got it to journal on, think on and plan on. I guess we'll see how it goes. I found this sweet little app MacJournal It's just pretty slick and let's me have multiple journals for thinking and planning and story writing. Also, for you bloggers out there, it connects to your blogg. Migration is usually such a hassle. I was also pleased to find that my Thunderbird mail and settings was a piece of cake coming from the PC to the Mac. All you have to do is copy your profile folder on the PC, transfer those files to the mac and replace your profile data files with the ones from the PC and Whazaa! everything was there- rules, mail, blogg subscriptions. Great stuff. I found out this morning that The Potter got accepted to another festival which is very cool. This one is in Italy. My buddy Dave's film got accepted too which is double sweet. The festival is Cortoons. I was having a few issues with their website, so no promises there- I think it may be a Firefox thing. A new friend of mine (Dustin Ryland- get a site so I can link to ya man) sent me some great insights from one of the great ones. Brad Bird on the duties of an animation director… • Do we understand the characters? • Are their motivations believable? • Do we feel something? • Can we follow the plot? • Is anything dragging? • Do we clearly understand the spatial relationships when they are important? • What is the timing of an edit? • What is the composition of shots? • When does music come into play? What kind of music is necessary here? . . . These things take a tremendous amount of thought , but for me the bottom line is Storytelling is Storytelling. And you either get them to feel something, weather it be feeling, scared or laughing at something, or feeling sad. Or you don't. This is from the Incredibles DVD- at least my friends's quick notes. Last week I went home to visit fam and friends as I'd not been home in about a year and a half. Hopefully, now that school is out, there won't be a repeat of that. One cool thing was that I discovered that a guy that had worked at my church growing up had in fact been in the industry for a long, long time and is now working at a studio he helped set up in Oklahoma City - Everytribe Entertainment. We sat down at a BBQ place that'd I'd not been to before that was slobber-like-a-fool good. If you're in OKC, look up Smedley's. His company is doing live action, but he had a lot of insight to offer on movie making in general. I was very appreciative of him letting me pick his brain for a few hours. I got the chance to visit a couple of studios last week in Dallas which was very slick indeedy. I was fortunate enough to visit DNA and ReelFX both. Headed over to DNA first and met up with a new acquaintance who was kind enough to offer to show me round. I took a little peek at their facilities and was gonna try and get some feedback on my reel, but my DVD wouldn't work on his box. I tested on Mac, tested on PC, but neglected to test on the little penguin that could. Oh well. A group of guys there went out to eat at a place called Red Robin which was very good- juicy burgers and tasty shakes. I had a great time chit chatting and even met a guy there who graduated from SCAD last year and found out we had a common friend in David Bokser as well...small world. From there I headed downtown into wonderful Dallas downtown noon traffic and drove around in circles till I found the hidden street sign signifying the road I was seeking. Namely, the one where ReelFX's new place was. Met up with a friend of a friend there and he showed me around. They've got a huge new facility. I met some nice people there and had a good time chatting with a couple of them. I finally met Keith Lango there which is cool cause I can finally put a face to a name as I'm a big fan of his tutorials. I also met Mark Behm at DNA which nice because I've been a fan of his stuff for a long while. All in all, last week was very cool all round. Well, seems like every cool person on the net bloggs. Maybe cool is an overstatement. I've seen some pretty cheezy ones. I'm also counting geek-chic in that assumption, so consider yourself warned. I've been using a pretty good app for news articles for it, but a blogg allows for the a bit more free thought- which is a good thing. This'll end up being a mosh-posh of thoughts collected from other places as well as a few of my own.